This is all fancy abstract math which has a simple physical interpretation when T corresponds to time evolution: the laws of physics do not change in time. Moreover it can be shown with a bit of effort and knowledge of C* algebras that Time as a functor = unitarity. 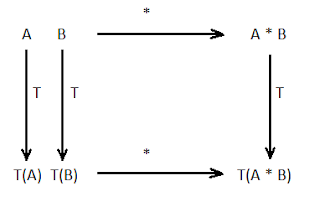 But what can we derive from the commutative diagram above? With the additional help of two more very simple and natural ingredients we will be able to reconstruct the complete formalism of quantum mechanics!!! Today I will introduce the first one: time is a continuous parameter. Just like in group theory adding continuity results in the theory of Lie groups we will consider continous functors and we will investigate what happens in the neighborhood of the identity element. There is not a single kind of time evolution and \(D\) is not unique (think of various hamiltonians). 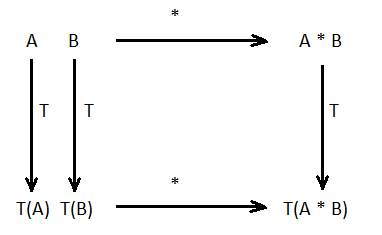 There is a natural transformation between different time evolution functors and we can express D as an operation like this: \(D_A = A\alpha\) where \((\cdot \alpha \cdot)\) is a product. This is extremely powerful, as it is unitarity in disguise. Next time we'll use the tensor product and the second ingredient to obtain many more mathematical consequences. Please stay tuned.